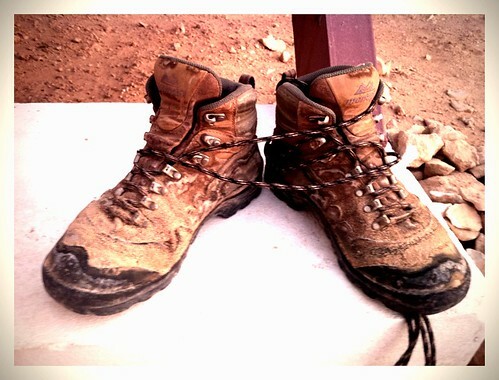 I’ve had these boots for years and they’ve climbed volcanos in Nicaragua, gone down abandoned show caves in Texas, skipped around the Giant’s Causeway in Ireland, through deserts and mangroves and over ancient lava on countless adventures. They’ve been slung over my shoulder in $7 hotels, forgotten in unmarked cabs, and sleepily pulled onto my feet over and over again. The treads are almost invisible, the cracks along my toes formed while I was crouching over yet another piece of archaeology, the laces replaced, at last count, six times. Once with yellow kite string. They actually hurt my feet now, these boots. But they’ve held up over the years. I’ve tried Clark’s desert boots, and while they’re great for photography and for sensitive archaeology, they didn’t stand up well to rocks and to desert sand. Lots of archaeologists just buy the cheapest thing and then throw them away, but I’ve kept these boots for years and they’ve served me well. When I wore out a pair of chucks, I’d sling them over a powerline–the only proper way to “bury” a pair of shoes that saw me through punk rock shows and love and disappointment. It’s time. The laces have lost their aglets and are fraying in the middle. The cracks in the leather fill them up with piles of dirt and rocks. The treads have no purchase and are slippery on the rocks. The boots are done, and so is the season here in Qatar. I’ll be back in the Bay Area in less than a week, and then at the SAAs, being an academic archaeologist again. Tomorrow, I think I’ll tie the laces together, throw them over my shoulder one last time & find them a proper place to live in the desert. Seems like a proper eulogy and a fitting burial. Amazing how long those have held out! Try Red Wing steel-toe work books. Mine are still going after more than 20 years, re-soled just once. That was a lovely homage to footwear. I almost threw mine out in London early last year after 3 hemispheres, 4 continents, 12ish countries and 10 years of service. I waxed sentimental for an hour or two and then couldn’t do it. No powerlines! Surely you should fill them with a little time capsule of stuff and bury them for future archaeologists to find, and puzzle over the meaning of these artefacts left by their ancestors?